Dorin Beu, RoGBC President, will be a speaker at this event. 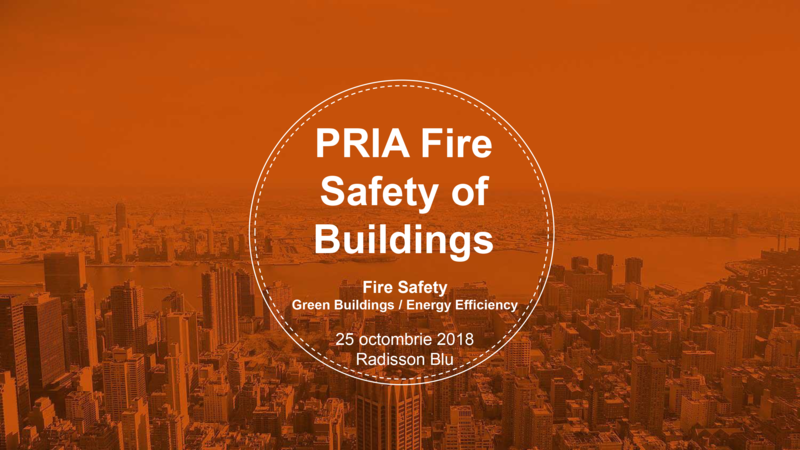 On October 25, 2018, the Radisson Blu Hotel will host the PRIA Fire Safety for Buildings conference. This event will touch on important topics such as the implementation of the provisions of the Directive no. 844/2018 on the energy performance of buildings in Romania, together with proposals to improve fire safety legislation. The technical standard on fire safety of buildings is almost 20 years old. Why is it necessary to address the fire safety of buildings? Because our way of life has changed - society is changing, technology is changing, our needs are changing. Consequently, the fire behavior inside the building changes. In 1950, a room could catch fire in 25 minutes. Today, it only takes 3 minutes. We know the nature of the buildings is changing: the construction industry is developing new innovative solutions that the existing rules and current testing methods have not overcome. We invite you to participate in PRIA Fire Safety in Buildings to discuss together how we can apply all these changes and how best to implement them in our legislation. This event will include: representatives of MDRAP, MAI, ISU, fire experts, firefighters, European and Romanian associations, international companies from different sectors such as real estate developers, materials producers, chambers of commerce and embassies, owners and owners associations, representatives of Parliament, architects, investors, insurers, banks, lawyers and representatives of the media. You can register and find more details about this conference on the event page.